"Call us for an in-depth Warehouse Study"
Traffic Jams in the Warehouse! You notice receiving, loading, and picking is backed-up. It is too crowded in the warehouse. Too much chaos and orders are not going out on time. Conveyors systems will eliminate crowding and you need to increase or use different storage solutions. Cannot Keep Up with Orders! You notice orders are not going out on time compared to before. Or you have an increase in orders but no room to add more product or staff. It is taking too long for staff to find where to store it or where to pick. The system isn't keeping up. You need a picking process that is efficient, such as a Warehouse Management Software. You can avoid increasing the size of your warehouse by making the best use of your vertical space. You notice the warehouse aisles are congested with either received inventory and picked inventory. You no longer pick orders in the morning and replenish in the afternoon. Pick and replenish is happening at the same time causing congestion. Replenish and Fulfillment is Overlapping! You notice the replenish team cannot unload while the fulfillment team is picking and visa-versa. Each team has slowed down during peak times. You need a Warehouse/Logistics/WMS study to reveal the areas that need improvement. You Hire Temps and Still End Up with Overtime! Your warehouse technicians repeatedly request overtime to finish. You hire temp agencies to keep up with orders. A warehouse study can determine the problem and provide solutions. 9 out of 10 time we can fix the problem without increasing the facility size, get rid of temps, and avoid overworking your warehouse technicians. Someone once said time is priceless, but if you’re in material handling you know time does have a price. You know precisely the price of time that’s wasted when you warehouse isn't organized. Or customer’s orders are inaccurately filled. Or slows down person to goods time. Or an outdated inventory leaves orders unfulfilled. Or workplace injuries make your team less productive. Time is money. Where do you find the time? You find it in our Material Handling Solutions. 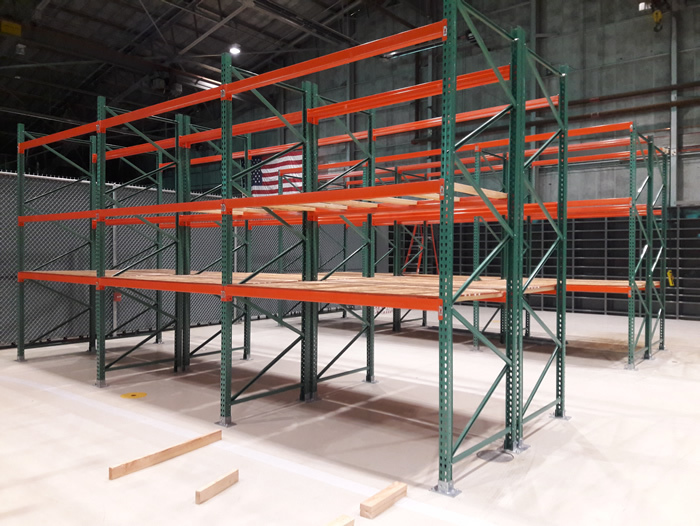 Our multi-level racking systems and vertical lists maximize your storage footprint and optimize picking modular cabinets and panel systems that you adapt your space quickly as needs change. Bins, shelving, and secure enclosures organize your inventory to streamline the handling process and avoid shrinkage. Automation system speed-up good person travel and inventory management while keeping labor costs stable and keeping your team safely out of the danger zone. It all adds up to saving time and saving money. Take the time to talk to us. We’ll give you back you time with interest.